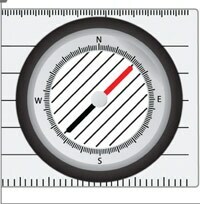 Place the compass on the map so that its long edge connects the starting point with the destination. The direction arrows should be pointing towards the destination. 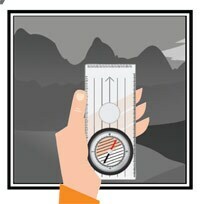 Steady base plate and hold the compass firm on the map. 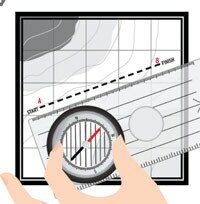 Turn the compass housing until the orienting lines are parallel with the meridian lines of the map. Hold the compass steady in your hands. Now, double check that the base plate is absolutely horizontal and the compass housing has not turned. Rotate your body until the magnetic needle is aligned with the orienting arrows in the compass housing, which now points to your desired direction.